yourself with. In particular, the Safe Money browser comes highly recommended. Recently, this feature was awarded an AV-Test innovation prize. It safeguards banking data, by mixing website security evaluations with a virtual keyboard and encrypted connections. Webcam security is an additional feature, which prevents intruders from accessing your tablet, phone camera or notebook. A good file detection rate is always one of the most important, deterministic & reliable basic features of an anti-virus products. In the famous third-party AV-Comparatives Test 2015, Kaspersky ranked #1 with 99.8% detection accuracy, F-Secure ranked #2 with 99.6% accuracy, while Bitdefender ranked #3 with 99.5% accuracy when detecting 125977 malware samples collected up to the 21st, February 2014. 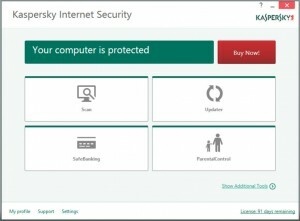 Kaspersky’s firewall makes its’ own security choices. It ascribes a trust score to every process: Untrusted, High Restricted, Low Restricted and Trusted. As the level of trust decreases, extra limitations apply. Trusted applications are allowed to access the whole system freely. Untrusted applications can not even start. Applications with legitimate digital signatures are trusted automatically, by default. You can tell Kaspersky which sites to load inside the browser manually. The software will prompt you, whenever you visit an ecommerce store’s checkout screen or your bank’s login page. The onscreen keyboard foils keylogging attempts, when you have to type your credentials in, and the Kaspersky password manager stores your passwords securely. You can purchase the product in five, three and one device licenses, and combine different versions of the platform as desired. Unfortunately though, Kaspersky has not done the same as McAfee, and provided a single price for an unlimited number of personally owned devices. Kaspersky does provide a rescue disc resource, a vulnerability scan (which searches for unprotected program code fragments), a privacy cleaner (to eliminate sensitive data), and a browser check (to search for potential weaknesses). You should make a Rescue Disk immediately after installing the product. This way, if any harmful malware (such as ransomware) manages to breach Kaspersky’s protection, you will be able to boot up using the Rescue Disk (USB, DVD or CD) to clean everything up. Better still, Kaspersky has highly effective and comprehensive parental controls, with features to permit or block web access and/or PC use, at certain times over the weekends or weekdays, and the facility to arrange breaks, say for thirty minutes after each hour. You configure and enable parental controls separately, on every Windows user account. To get started quickly, you can select one of a few profiles. The only thing the default profile does is monitor online activity. Selecting the Teenage profile prevents access to adult orientated websites, and the child profile prevents downloads too. Obviously, you can make your own choices from the fourteen potentially undesirable categories. A helpful tools page is provided, which displays real time memory, processor, network and disk use. You can block games by file name or age rating, as well as access to pornographic web content. Contacts for communication can be blacklisted or whitelisted. You can even prevent the use of specified keywords on online forms. With the backup module, you can copy files to network, online or local storage, although the package only features the two gigabytes freely available from DropBox. You have to purchase any additional storage you require (regardless of how many devices you have covered), which is less than satisfactory. Elaborate features aside, Kaspersky still delivers well on the fundamentals. The interface allows you to smoothly access the most vital security tools. The settings in the Protection Center display a list of the suite’s features. Toggle switches are provided, which can be used to disable or enable each feature individually. The settings are extremely detailed, and you can select how the system responds to identified threats, and utilize a Gaming Profile to prevent interruptions while you are playing, or watching full screen videos. There is much to familiarize yourself with, but it is all laid out in a simple, user friendly way. 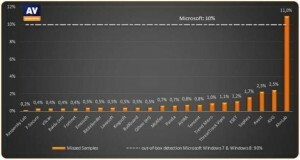 Arguably, Kaspersky is a better option than competitors like Eset, Avast and Norton. A total protection, three device IS suite for less than $50 is value for money, and when this includes cover for all the main platforms, it ought to be versatile enough for most. The technical prowess of Kaspersky Security can not be faulted, and when you can obtain a three user, twelve month license for about $30, it is certainly a bargain.